I cannot express how exactly these taste like a Reese’s peanut butter cup. They are, in a word…perfect. We start with some simple ingredients. 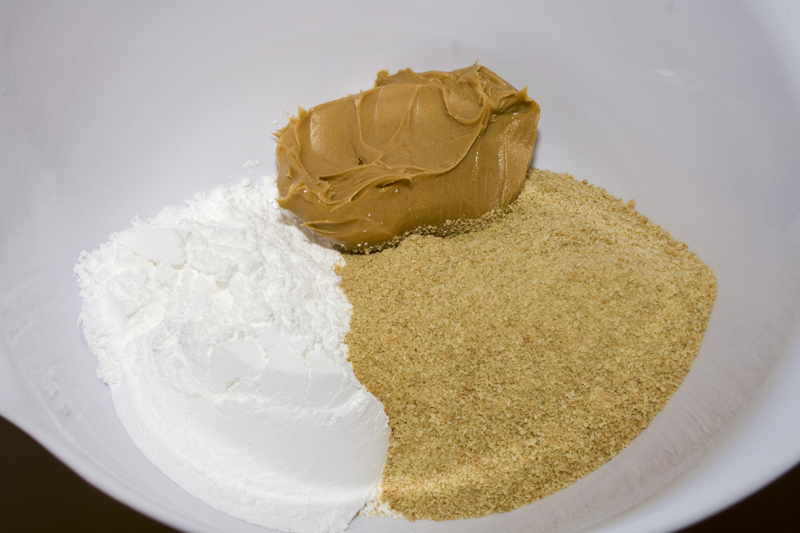 Graham cracker crumbs, powdered sugar and peanut butter. Mix it all together with a wooden spoon until it looks like this. See? Doesn’t that look like I spent an hour scooping out the insides of a couple hundred peanut butter cups? Press it into a pan. I love offset spatulas. They are amazing. By the way, I was feeling totally lazy tonight. Didn’t even print this recipe out. Just unplugged my netbook (isn’t it cute?) and set it on the counter. Yes. This is how I roll. Now we’re going to melt up some chocolate and peanut butter into a gorgeous pseudo ganache. I totally did mine in the microwave cause I didn’t want to dirty a pot. Don’t eat this straight out of the bowl. 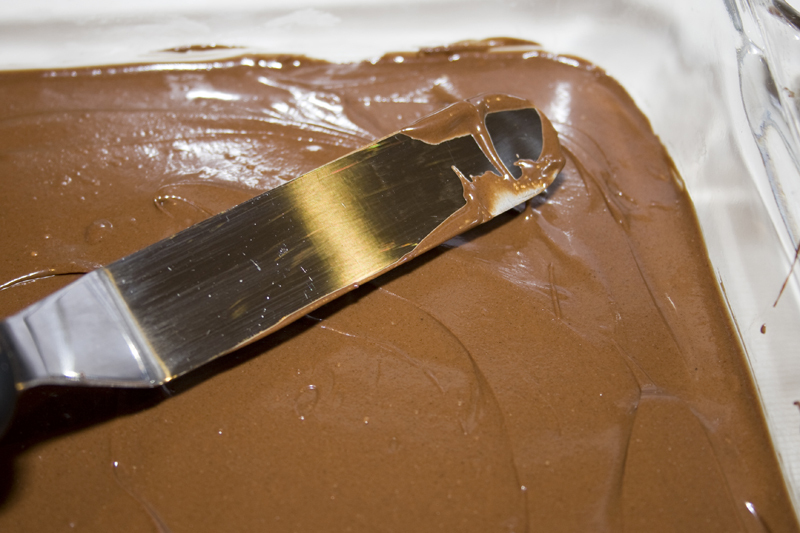 Give your spreader a wipe down and use it again to put the chocolate on top of your peanut butter layer. Chill for an hour, then cut into squares. I like to use a pastry scraper for this. It fits so nice and neatly into a dish. For perfectly square and even bars. Peanut butter and chocolate perfection. Happy dance. Happy, happy dance! I had a problem getting them out of the pan and cutting them was next to impossible. I am going to try using wax paper, parchment, or something and cutting them before they get too hard. After one hour in the refrigerator, they were too hard to cut without ruining their appearance. They were delicious and will make them again. You can always use a foil sling, lift them out of the pan whole and then cut them. I always use unsalted butter unless the recipe specifically calls for salted. The different manufacturers use varying amounts of salt to make their butter so it’s a guessing game unless you stick with the unsalted. I haven’t made these yet, but I have other similar recipes and would love to compare. That said, your comments are hysterical. Better than late nite tv. Thanks for the laugh. I may borrow some of your wit. I made these a few weeks ago and they were delicious! But I am curious if others had the problem of the chocolate layer coming off the peanut butter layer when cutting them into squares. Any solution to that problem? Hmmmm. I don’t think I’ve had any other comments about that. The melted chocolate should be melty enough to “glue” itself to the peanut butter layer before it hardens back up. Glad they were yummy though! u need to cut the cake before the chocolate has cooled down completely or u can either cut it with a VERY hot knife lol and then cool it back down otherwise the chocolate is gonna crack. i know because ive worked in a cake factory lol. I think if the pb layer is too cool, then the warm chocolate will harden too quickly and come apart from the pb layer. The pb layer should be warmish or a warm room temperature/not refrigerated or left to sit in too cool of a place before putting the warm chocolate on. The chocolate is hardening before it has a chance to bond with the pb layer. It might help to let the chocolate set/cool a little at room temp after spreading instead of refrigerating it right away. 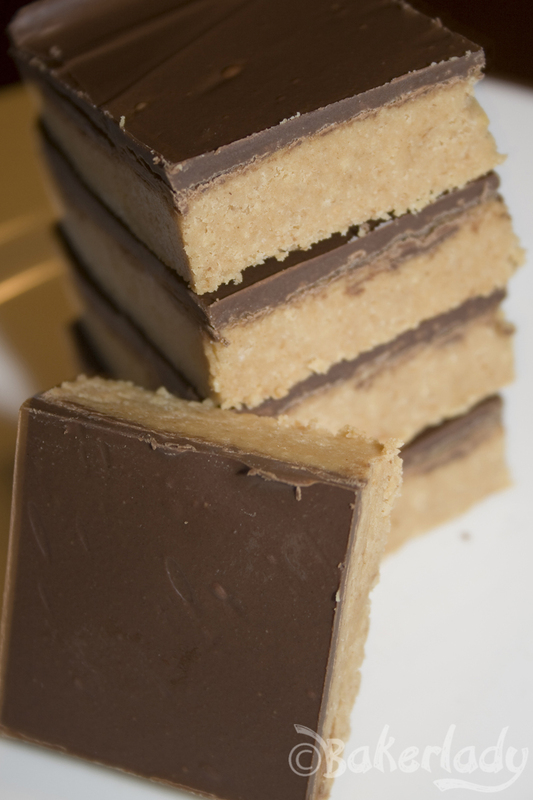 The fats in the pb layer must not be adhering to the fats in the chocolate because of the rapid cooling. Try scoring the peanut butter mixture with a fork before pouring on chocolate topping. Also, you can melt a teaspoon of peanut butter to the chocolate to make it a little more pliable and less prone to cracking when hardened. Just an idea, but you could use a fork to poke some holes into the bottom layer and thus allow the chocolate to fill them in to hold the top on maybe? Yes, I make a very similar recipe and have always cut into bars before chilling. First cut from one side then go back in the other direction to make a nice chocolate swirl design. Score the chocolate topping with a sharp knife tip before trying to cut the bar. Use it warmed (the knife). I like how your roll – LOL! Because of you I’m willing to gain 5-pounds to try this! Way to take the risk. You won’t be sorry! I live in the Pacific Northwest where it’s never really that hot. I’d keep them in the fridge where you are. store them? you didnt eat them all in one sitting (or standing over the pan)? I made this today and it was fantastic, easy, and I had all the ingredients! Thanks for sharing! Aren’t easy (and fantastic) things just the best!? As kids, my mom didn’t use the graham crackers. It’s still good. 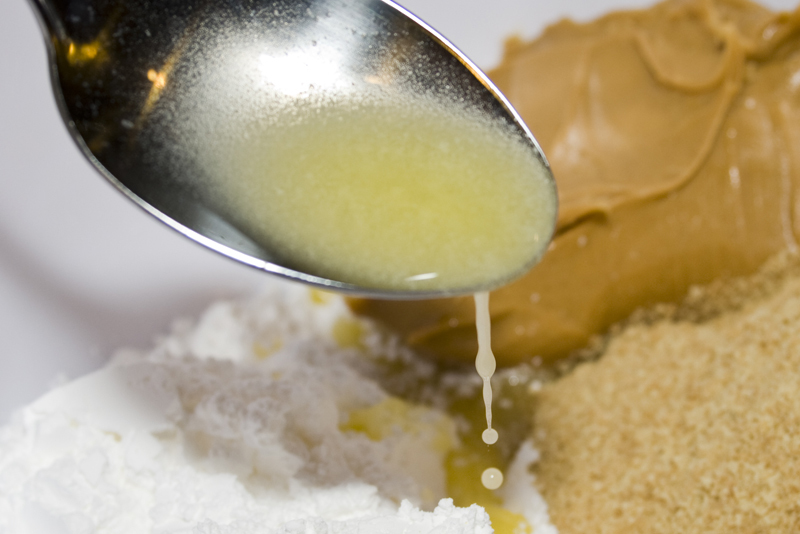 We just would melt the butter and peanut butter (has to be done on a stove–microwave does not work for this) and then add powdered sugar until it thickened. Refridgerate until hardened. Cheap treat for us kids. No chocolate top but we weren’t picky–it was a sugary treat after all! I’d love to try it with graham crackers though. Hi, is this really for a 9×13-in. pan? Your pan looks more like a 9×9. Please verify. Good catch! I have the smartest readers. Yes, I used a 9×9 – but I’m pretty sure (it’s been a while since I made these…I’m going off my pictures) that I halved the recipe and put it in a 9×9. The full recipe ingredients are posted – so use a 9×13. Hi, Is this recipe really for a 9×13-in. pan? Your pan looks more like a 9×9. Please verify. Thank you! Good catch! I have the smartest readers. Yes, I used a 9×9 – but I’m pretty sure (it’s been a while since I made these…I’m going off my pictures) that I halved the recipe and put it in a 9×9. The full recipe ingredients are posted – so use a 9×13 pan if you’re making the ingredients listed. Thank you, I plan to make these this weekend! You are most welcome! Enjoy!! I made this yesterday and had only orea crumbs instead of graham cracker crumbs and they were delicous !!! I like to use my Nook tablet 🙂 Longer battery life than my old laptop! Genius! I have a kindle…I should totally use it! I am with you. I plan my entire Thanksgiving or Christmas meals on my iPad and then put all the recipes there and cook from it in the kitchen. How great is that? I found this on pinterest! can’t wait to try it, yum yum yum! They’re so good. And so bad. I love them! Thanks for stopping by! Just tryed this, trying to wait patiently for it to be done. Saw your post on penterest. Thanks for sharing!! Can’t wait to try these bars,,,sure they will be a hit !!!!!!!!!! I’m sure they will be too! Enjoy! I am making these right now gluten free! I just made them gluten free. They are wonderful!!! OK, they are still chilling, but the batter is sooo good. I used EnviroKids, Koala Krisp. They are like a coco krispies. And of course gluten free chocolate chips which aren’t to difficult to find. I used Baker’s Secret from Aldi, but Nestle are gluten free too. At least they were last time we used them. It’s so nice to have a dessert that no one knows is gluten free. My in-laws won’t eat it if they know. Not sure if its because of a cost issue (GF flours are very expensive) or because they don’t like them. You are very welcome! Thanks for listing what you used for all the other GF readers out there! My kids loves reerse’s, I will definitely try them..
Then they will LOVE these! Taste just like them! 🙂 Enjoy! They are delicious and ah-mazing! You will love them! My husband says “you know that’s right!”. 🙂 Thanks for visiting! 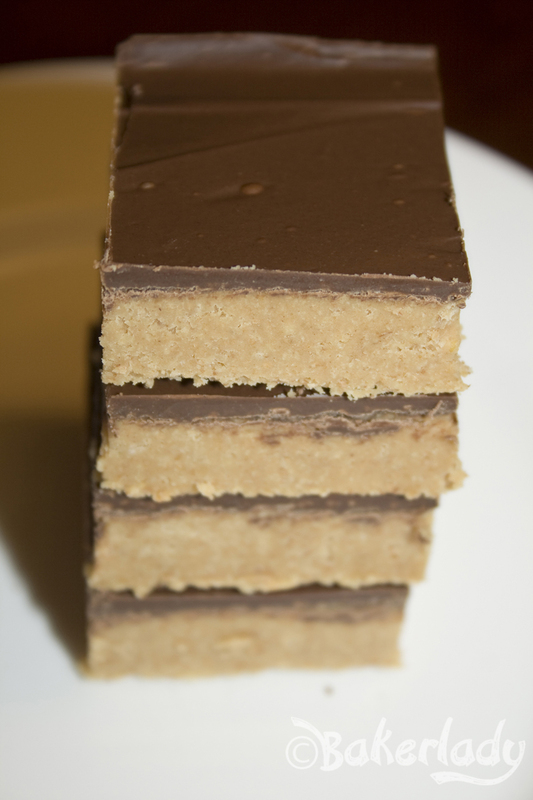 Hi these are so similar to the Peanut Butter Bars recipe we have from my Great Grandmother in our new ebook at http://www.amazon.com/kindle/dp/B007LEI8HK … it must be an old way of making a yummy treat, these are very good, and super easy! Haha, indeed! She left us with thousands of hand written recipes and recipes clipped from various things. Going through those, doing our blog, and makig cookbooks is our new project! You’re the devil. I think I love you. I love readers who know how evil I am and still love me. I don’t have graham crackers, how do you think Nilla Waffers would taste ? I think the taste would be ok. It’s a vanilla cookie so it isn’t going to throw the taste off too much. Nilla wafers are harder than graham crackers and you’d be pulsing them fine yourself from the whole cookies. I would just make sure to get the crumbs really really finely ground. Let me know how that works for you? Please? LOL. I’m right there with you. Could you tell me what kind of peanut butter you used? 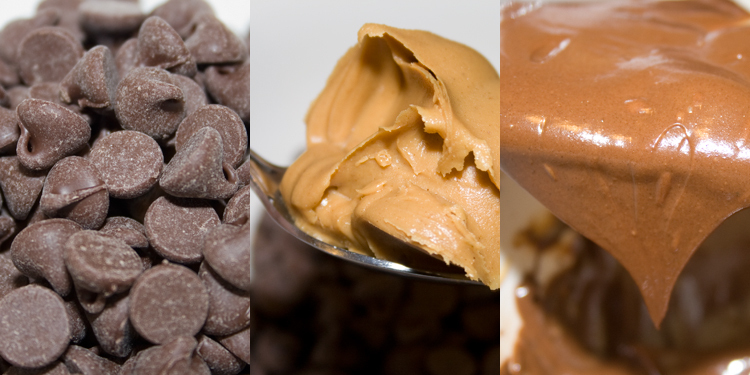 Peanut butters all taste so different. I used either JIF or Skippy’s. Those are the two I always have around for baking (the natural stuff may be way better for you, but I don’t find it does that well in baked goods). I’ve used both Jif regular peanut butter and Jif reduced fat peanut butter, and I prefer the saltier (less sweet?) taste of the regular peanut butter. I think it tastes most like Reese’s peanut butter cups! Good to know! Maybe next time I’ll try it with some of that. At this moment I want to erect a stature in your honor. However, tomorrow when I have eaten the whole tray in one day I may be cursing you forever. Ether way these are amazing. I use real peanut butter, you know the stuff that is just peanuts and no other chemical ingredients, and it worked great. I’m glad you are at the statue erecting part…at least for a little while. I’ll have to let my mom know the real stuff works- she never buys the “fake” stuff and I’m never sure which recipes are going to turn out well with the real peanut peanut butter. Nostalgic recipes are the best! How long will these stay good for, unrefrigerated? Thinking of sending these to the guys that are deployed. That’s a wonderful idea. I would guess you’d want to have them eaten within about a week. I find that these get soft veeeery quickly of you don’t refrigerate them…the butter and pb go soft fast. These are G R E A T! My family has been making these for years, they’re so good! Always a hit at holiday parties! You can also sprinkle the chocolate chips on top, pop in oven for 5 minutes, then spread evenly. How do you mix the chocolate chips with peanut butter that way? We don’t. We just do chocolate for the top layer. You can use 2/3 chocolate chips and 1/3 peanut butter chips, melt in a 200 degree oven for 5ish minutes and then spread the chips. I want to try these for Bible Study Thursday night! Oh my goodness! This look awesome!! I can’t wait to try them! These look amazing, but as a Weight Watchers follower, I’m wondering if there is any way to reduce the calorie count! Any suggestions for ingredient substitutions?? I suppose you could try using some kind of butter substitute, and could use reduced fat grahams crushed fine, but other than that – I don’t think there would be good results from subbing any of the other stuff. Best way to not lose quality but reduce calories is to eat a smaller serving size. They should still taste PERFECT yet last longer. They ought to freeze well or even keep in fridge for a long time. Then maybe you won’t “wear” them on your hips?!!!!! I’ve just now found this recipe so have not yet made them but in the photos they look like large pieces. I will make them with my granddaughter soon. She will love these!!!!! And she has three brothers to help us devour them. Unfortunately my husband is allergic to peanuts so we will do this early in the day before he gets home to smell them! They are fairly decent sized bars the way I cut them up. Great idea to make them smaller. Freezing them works very well too! I LOVE, LOVE, LOVE these! I have made them quite a few times. People always say they taste like Reese’s Peanut Butter Cups. I laughed at your comment about how lazy you were. I can up you on that one. LOL! I was too lazy to unplug my laptop and bring it to the kitchen…so I just took a picture of the recipe with my phone and followed it from there! 🙂 Thanks for sharing! Anyhoo, I made this recipe and will be posting it on my blog today with a link back of course, and would love it if you stopped by. http://www.michellestastycreations.blogspot.com. Have a great weekend. Forgot to comment…..These are AMAZING! I will be adding this recipe to my go to recipes. Love this recipe, have made them the same since I was a kid. Now, I like putting half the chocolate on the bottom and refrigerate while making the pb part. The other half goes on top as per instructions. You have to be more careful while spreading the pb mixture, but it’s worth it having the chocolate on both sides. And definitely line the pan (foil or parchment) so you can just pick the whole thing up when done and not have that lovely bottom layer of chocolate stick. 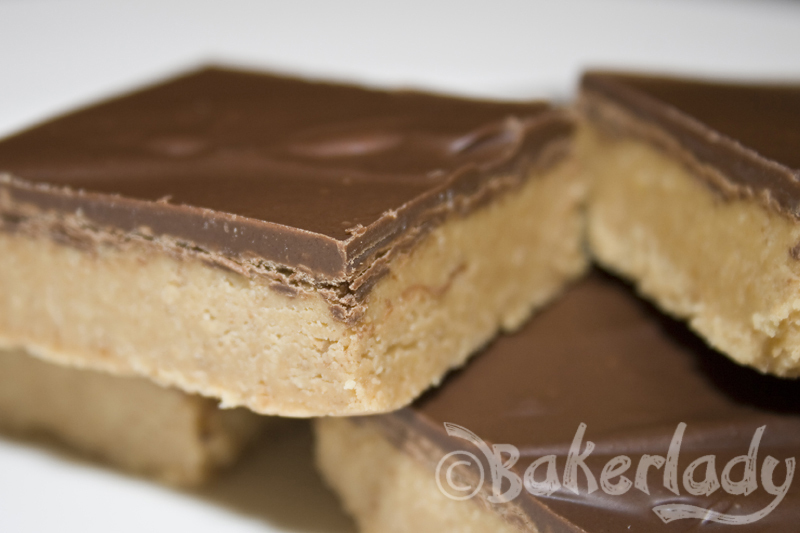 Double peanut butter bars. Works for me! Glad they were still good! Found these running around pinterest and currently have them in the fridge cooling (my husband is anxiously checking them.) They taste great. I used “real” peanut butter (just peanuts and salt) and as i didn’t have grahamn crackers, I ground up almonds and oatmeal in the food processor for substitute. Not the same, but gives it the same texture (plus slightly more nutritious, but who is worrying about nutrition eating these?). And i doubled the whole recipe and put it in a 15X11. So not exactly the same as here, but they still turned out delicious. My only question is how to spread the chocolate so evenly on the top? My chocolate mixed in in places. I made these and they were very good. The only problem I am having is getting them out of the dish. I did not cut them up in bars and have just cut them as someone wants them. Any suggestions? I guess I could use foil or wax paper next time? I always have a little trouble with the first one out of the pan (like the first piece of pie). If you’re having trouble, I would go around the edge with a knife. Even if you aren’t taking all of them out, it will loosen the batch from the pan. And yes, a foil sling or wax paper would make it all the easier. If you eat the first one out of the pan before you serve them, no one will know. My husband just e-mailed me stating he needs to bring in a dessert for a potluck at work – tomorrow! So, glad I found these on Pinterest – sound so easy and he loves peanut butter cups. Thanks for posting – so glad I found you! Thanks for visiting! I’m sure the work peeps will enjoy! I made these today with my 1 1/2 year old. He loves helping (or should I say tasting) and it was great to finally make a treat that doesn’t have eggs so he could “help” all the way through the cooking process. Oh, and they were amazing! Thanks for sharing. How fun to have a little helper! Glad you enjoyed making them! You just made me a rockstar in my house with this recipe!!! My kiddos are going crazy for them and I am one happy Mama that they are happy…Thank you! I have a recipe that calls for melted chocolate on top like this, and I just pop a can of milk chocolate frosting in the microwave for 45-50 seconds on high. It pours out easily and hardens when it is cooled. So easy! This is going with me to our next family get together, the kids are going to love it. Hooray! I love it when a good thing gets better! I didn’t have any graham crackers, so I made this with saltines instead. It’s fantastic! Thank you! And I highly recommend trying it with saltines sometime! I don’t know about you, but I love my peanut butter and chocolate with a bit of salt. Mmmmm. Addition of salt sounds fabulous! ooohh good! i’ve been reading all of these comments in hopes of seeing how a salty base went. i have way too many ritz crackers left over from xmas treats and think i’m going to try these with a ritz base, since saltines sound like they worked! Salty goes with chocolate every time! Let me know how the ritz turns out. Will be great to add another on the list of substitutes. Ive made something just like this before – so good — but I couldn’t cut out perfect squares with straight edges out of mine! Yours look perfect! I made these yesterday. I didn’t have graham crackers so I used cheerios. Delicious! I can’t stop eating them. These look way good i think i will use these as xmas gifts find a pretty box some tissue paper and a ribbon !!! seriously. i made these yesterday…. SOOOO good!!! thanks for sharing!! delicious~! I made them in a 9×13 pan and they were really thin and the chocolate didn’t spread all the way across until I melted more chocolate chips. For 9×13 I will half the recipe and add that much more next time and use a whole small bag of chocolate chips. Thanks for the recipe! my buckeyes are basically this in ball form, but searching ideas for a bake sale this sunday I stumbled upon this and thought “DUH! BIG RED TRUCK!” but now thinking about it and my recent dicovery of nutella (I know I’m way late to that party) what would your opinion be using nutella (well, a cheaper version of that sweet ambrosia) in place of he peanut butter? I haven’t really done much baking with Nutella, so my opinion would totally be a guess. I think it would be a little too chocolatey (is that possible?) if there was chocolate in the bar and the topping. But, these are so easy to make, I say give it a go and if for some reason they are horrible – you’ll still have the time and energy to whip up another batch. Let me know how it turns out if you try it! Would you be able to use margarine instead of butter for the recipe? And I don’t have a 9×13 pan, I have a 5×8.5 inch pan, how would I alter the recipe? Halve it like you did? Also, these look delicious! Can’t wait to make them. I halved it for an 8×8. So, in your pan if you halve it – the bars will be quite a bit thicker. I would do a third of the recipe for that size pan. I’m an all butter girl, margarine is just never the same to me. But, it never hurts to try! Thanks! You do deserve a monument for this recipe! I didn’t have crackers so I used oatmeal only, it was delicious. After unsuccessfully cutting few pieces, I took it out of the fridge for some time to soften a little then cut it. It came out beautiful. Oh, and I hadn’t read through these comments yet, so we used a full recipe in a square dish just like the one in your pics. Hopefully, by chilling over night, they’ll just be extra thick peanut butter chocolate bars–even better! This may have already been answered, but is there any way to use splenda with this? It looks sooooo good, but I’m diabetic. I never really use anything but real sugar. Does splenda make a powdered sugar blend? I think so. I will have to try it. It looks so good. Let me know how it works! If they have a powder sugar blend I’m sure it will turn out great. I don’t have have graham crackers. Would crushed vanilla wafers work? I so want to try these without waiting until my next shopping trip! Thank you so much for this recipe! My husband and son loves peanut butter and chocolate! I made these for the Rokie’s baseball game tonight! Thanks again! Great snack for a ballgame! Yeah, I’m totally making these. Like right now. Holy cow, that’s a gorgeous dessert!! Just made it! it is SOOOO good! Thanks for posting! I have these chilling in the fridge right now. I found them on Pinterest and I can’t wait to try them. I am going to my first Bunco game tonight and was told to bring a dessert. Fingers crossed!!! To be certain of quality control I did lick all of the bowls and spatulas used in this recipe, so I am pretty sure these are going to be killer! Quality control is a must!! Good on you! Most simple and delicious recipe ever I ‘m making it right now tasting while making and already am loving it so much.Thank you this is a great saver! They should erect a statue in your honor…insanely good!!! Perfect no bake summer recipe! Satan, get thee behind me. Then grab me by the hair, pull my head back violently, and force EVERY LAST ONE OF THESE INTO MY MOUTH. #Brilliant. Ooooh, I think that’s the first time I’ve been called “Satan”. I like it. Do you provide pictures? I want to get the likeness right for the monument. These look delicious! I’ll be sure to hold very still while posing for the monument! I didnt have enough graham cracker crumbs so I used some pretzel TownHouse Flipsides. YUMMM!!! can’t wait to see my hubby’s face when he bites into one for desert! I cannot imagine why the peanut butter would be runny. Hmmm. Hope they eventually firmed up. TheSe are fantastic! Do they need to stay refrigerated? Bummer Kids just ate the last of my Graham Crackers for after school snacks today!! I would have totally been making this tonight!! Thanks for the Simple Yummy Treat!! BTW Love your offset spatulas (I sell Pampered Chef)!! You are welcome. Buy extra grahams next time you’re out. I have a new recipe coming soon that is AH-mazing and simple and uses them. 🙂 I love my spatulas too! I JUST made these and can’t wait for that hour in the fridge to pass already! I did have a sneak peek taste of the peanut butter mix and the chocolate and they both taste delicious so far! The longest hour in the world is the one where you’re waiting for a treat to be done! I believe other readers have used various dry cereals as well as nilla wafer cookies with success. Must. Go. To. Store. Need. Graham. Crackers. All kidding aside, I can’t wait to try these; thanks for sharing! I am excited to try this! Do you need one cup of melted butter, or do you melt 2 sticks (1 cup) of butter? Thanks! These are awesome, oh my I will have to start my monument in your honor as soon as I can drag myself away from the pan of Reese goodness!!!! Excellent. I’d really like to be holding a cookie sheet and spatula in the monument. 🙂 Glad you love them! I’ve been making something like this for years and the family comes unglued if I show up for the Holidays without them! This is a bit different, so I’m anxious to make them, maybe this week-end. I love Pinterest! I got a Nestle Tollhouse cookbook (with this recipe in it) for Christmas a few years back, and it is hands-down my favorite! I love, love love, these. I generally make more of the chocolate topping….it makes them even better…Sigh. Now I want some!!! I should have known Nestle would have something like this. I have one of their cookbooks and it’s awesome. More chocolate is always better. I used to buy these al a cart in high school and would have loved the recipe years ago… where were you then?! Anyway, here in Wisconsin they make them with rice crispies…yuck… not the same. So glad I found you on Pintrest… when you pin the support group I will have to join… highly addictive! I’m so jealous of all of you who got these in school. I had no such deliciousness on a cart. A girlfriend of mine calls that support group the Betty Crocker Clinic. 🙂 Glad you found me!! OH MY GOLLY! These do look amazingly delicious! I need a pastry scraper so I can cut perfectly square bars! They look so professional that way and not all wonky like mine usually do! Thank you for posting this, I lost my recipe for these and glad to have it back again. Thanks so much! I hate losing recipes! Glad I could be of help!! I keep all my favorite recipes on computer in a file because they are easier to locate as well as easier to send to anyone who requests the recipe. Just made this! A few tips that’s did to help with consistencies. I kept about 1/4 of the melted butter aside from the pb mixture to keep it from being too runny like someone stated. It turned out great. Then I added that 1/4 cup of butter to e chocolate pb mixture in the microwave to keep it from seizing and give it an easier time to spread. 🙂 thanks so much for the recipe! Amazing!!!! Glad you found some tweaks that worked for you! Need a quick reply … we are going out of town and I want to make these today, can they be frozen? You betcha they can be frozen! Put some wax paper between them though so they don’t stick together! THANK YOU so much. They are in the fridge now and I know my hubs will LOVE them. He loves those Reeses Snickers thingies … and eats them like crazy. Another question, could you use chunky peanut butter in these as well? I am DEFINITELY trying these! They seem too easy not to! Curious about one thing though… I would love to make and send these to a friend who loves Reese’s. Any advice on how to ship them? Do you think that would be okay or not so much? Thanks! I think they’d be ok if you shipped them in a box and made sure there wasn’t room for them to flop around too much. The graham makes them fairly sturdy. I’m excited to try these…..and add some oatmeal and wheat bran in place of SOME of the graham crackers. Plus, maybe cut it in smaller pieces to satisfy my sweet tooth but not break the calorie bank. 🙂 Tahnks for sharing!! Let me know how your substitutions work out! The substitutions were fantastic. I think I will add more wheat bran next time and less oatmeal. The texture was still good and the taste was amazing. I had to quickly share the pan of bars with several people so I wouldn’t eat them all myself. Thanks, BakerLady! Would crunchy peanut butter work? The consistency will be different, but I’ve had a couple readers use crunchy with success. Any thoughts on what to exchange for the graham cracker crumbs to make it gluten free? I’ve had readers substitute crushed rice chex with success. Also, you could always go the gluten free graham route. LOL. I feel the same way about the GF grahams. Glad the rice chex sounds like a better idea for you! Made these for my daughter and son-in-law after they came home with their new baby. Thought they’d have a treat to offer friends who visited:) They liked them so much the pan only lasted a couple days. They’re obviously delicious! Better than the candy bar especially if you use a good chocolate. I think the commercial chocolate can taste waxy. These don’t! Great taste! Awww! New babies are so fun. What a treat for your daughter to have something so delicious to munch on. I’m soooooooooo gonna make these! And, by the way, my favorite part of the recipe was the “mmmmmmmmm……..butter” LOL! What can I say? Butter is delicious! Enjoy the peanut butter bars! I’m amazed how many moms out there used to make these. Mine baked all the time, but I’d never heard of these! Isn’t that hour torture? I also got a similar recipe in high school (no PB in the topping) and love it. I have been using all natural crunchy peanut butter and graham crackers and it’s fabulous. However, I just found out I can’t have butter ever again- sob- and wonder if you have any suggestions? I tried making them with a dairy free butter substitute but the aftertaste was bad…. Anyway, thank you for sharing this recipe- it’s such a great one! No problem! Off limits foods are no fun at all. Sorry you have to deal with that! WOW, that’s allI have to say! YUMMY! I didn’t dare make a 9×13 of these, so I quartered the recipe, and then just made them into balls dipped into the chocolate! Worked great! After they have chilled and have been cut, what is the best way to store them? In the fridge or room temp? I would store them in the fridge. They have uncooked butter in there. Quick, easy, and very tasty! Love pinterest for helping me find this recipe. 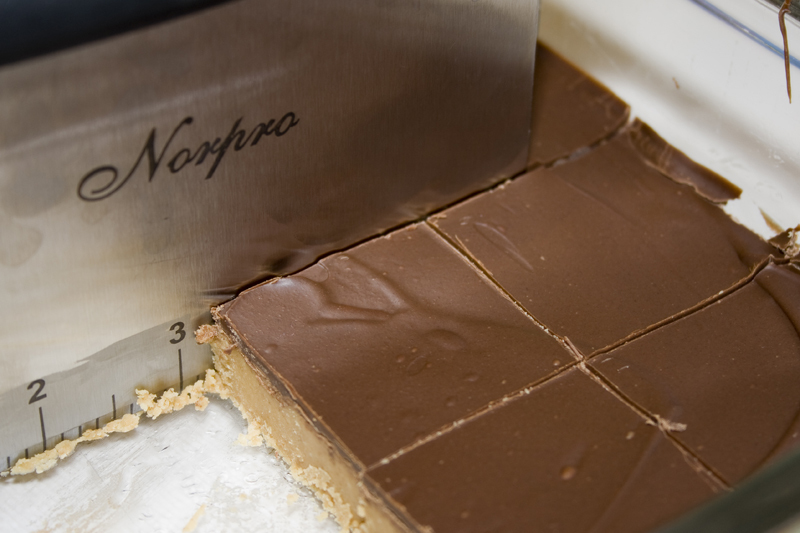 Using a pastry scraper to slice bars!!!! Genius! I just have semi sweet chocolate squares….can these be used and how many do you think I would need to use??? Yes, the chocolate squares can be used – just chop them up before melting them. Chocolate chips are about 6 ounces (weight) per cup. So use 8 ounces (by weight, not volume) of chocolate squares. I have been searching for this recipe for years!!! 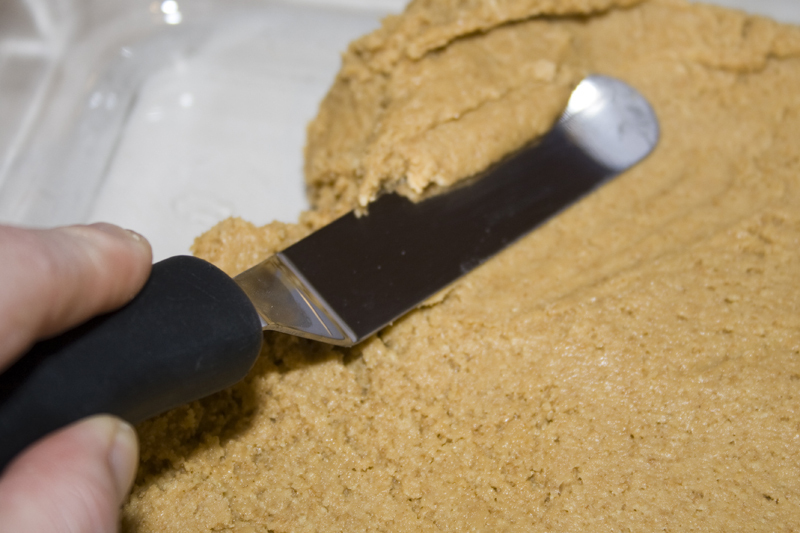 The graham cracker crumbs is a different version but I will give it a try! Thank you so, so much!!! You are welcome!! Glad you found me! found this on pinterest- made tonight- tried to make them in mini muffin tins with chocolate on bottom, then pb mixture, then chocolate. When they weren’t completely firm, they came out ok w/ help of knife. when I chilled completely I couldn’t get them out at all w/o breaking them up. 😦 They taste AMAZING though. 2nd batch (choc on bottom) is now in bar form in the fridge! thanks for a great new go-to recipe! Sorry you had trouble getting them out of the mini muffin tin. It’s nice that the recipe is so quick and easy. You (obviously) can just whip up another batch! Enjoy the bars! I am totally not a baker, but I am def. a chocolate and reeses lover, so I think you really have started something here!! 🙂 Thanks a bunch, I can’t wait to make them!! Just want to say – you did and absolutely amazing job in presenting this. Photography and descriptions are perfect. Gotta try these it’s too hot to bake! I’m working on a better print function for the blog, but for now, just highlight the recipe text, click print from your file menu (top left of your screen) and make sure the “selection” button is highlighted. Probably digestive biscuits would be the closest thing you have in New Zealand. I’m not sure what super wine biscuits are. Grahams are a sweet, almost cookieish cracker. And now I found the Chocolate Peanut Butter Pretzel Bars recipe. lol. Guess it’s a good idea! I made these so very easy creamy, rich, chocolaty squares of happiness! Used crunchy peanut butter ‘cuz I love peanuts! Thank you for the recipe! I’ll bet they were yummy with the added crunch! You are welcome! Well done you! Thanks for sharing your success!! Do you know how well these will hold up in hot weather? Has been and will still be 90+ this weekend. Have been dying to try them. thank you. As a person pretty unfamiliar with all things culinary, I am so glad I have found this blog! Can’t wait to try out this recipe 🙂 Keep up the good work. Thanks Kelsey! Anyone can be a great culinary genius! Enjoy becoming one! Based on everyone’s review of this recipe, I ran to the store to pick up some graham crackers and chocolate chips. When I got home I was disappointed to discover that I had bought cinnamon graham crackers instead of the original ones. Knowing that the cinnamon flavor would not jive with the peanut butter, and being too lazy to run to the store again, I desperately went in search of a suitable substitute. PRETZEL CRISPS (pretzel chips). I ground them up as fine as I could and proceeded with the recipe. Let me just say that the crunch they provided combined with the creamy chocolate topping was phenomenal! I have no idea what the original recipe tastes like, but I do know that this recipe with the ground up pretzel chips was fantastic! I am looking forward to comparing them to the graham cracker recipe as soon as I can get back to the store. Mary, that’s a great substitution – there’s a similar recipe on Bakerlady using crushed pretzels giving an added crunch to the peanut butter bar. Well done you. Yuuuum! Sounds like a wonderful substitution with the chocolate frosting! Just made theses and they turned out GREAT! Only difference is I used sunbutter instead of reg peanut butter. My family LOVES peanut butter, but needed to use up the sunbutter and we’re going to picnic tomorrow where some people are allergic to peanuts. Everything turned out just great, thanks for the recipe! You are welcome! Happy picnicing!! Happy 4th! I’m going to make these tomorrow, but I’m going to try almond butter instead of peanut butter. We’ll see how it goes! 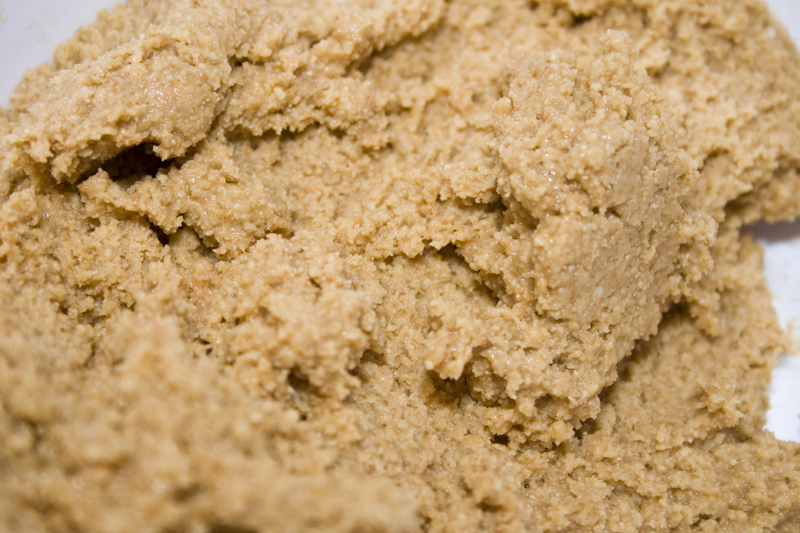 Lots of readers have had great success with other kinds of nut butters. I’m sure they’ll turn out fabulously! They were delicious! Thanks for this awesome recipe! I have a husband like that. Not allergic to chocolate, needs calories. It is very annoying. Glad you could find a substitution that worked for you guys! Well done! I so love Pinterest. I am a big peanut butter (Peter Pan) lover. This recipe looks absolutely delicious. My boyfriends daughter are coming this weekend so I am going to the store so we can make them together. Then will make them again when my son comes back from his dads. And then make them again for a Moosel Lodge function or a bake sale or a bday party or for a game or movie night. LOL, hmm, wonder how many other occasions I could come up with for an excuse to make them. One of the girls (14 yrs old) has Crones disease so I will have to do some substituting for a batch for her. Pinterest is the BEST! Glad you found these! Sounds like you have a lot of things to make them for! Enjoy! How do you think it’d do with Nutella as the top spread, rather than the chocolate/pb mix? If you like nutella, it would probably be delicious. Not sure how firm nutella gets though, it might be a little soft to cut into squares that are pretty. Does anyone know if these freeze ok? I have never frozen them, but I see no reason why they would not freeze very well. Reese’s Peanut Butter cups are AWESOME frozen – I’d guess that these would be too. They freeze very well. I cut mine up and then wrapped in freezer paper … they were yummy both frozen and when defrosted. Thanks for the feedback Connie! You betcha!! Thanks for stopping by! Did this recipe today! I have to say, being a sucker for chocolate and peanut butter, this is THEE recipe for my craving!!! Thank you! Thank you! Thank you! Followed your recipe to a T and it came out perfect! I’ve been making a similar recipe for several years, except some of the measurements of yours are a little different than mine. I’ll have to try your now. 🙂 When I really want the pb and chocolate overload, I put this into a 8×8 pan instead of a 9×13, and let me tell you, it is delish!! Half the size pan sounds like double the deliciousness! Made this for my family last night and there is only 3 bars left. Followed recipe exactly and it turned out wonderful!!!! Thank you! Thank you! Thank you!!! You are very welcome!! Glad your family enjoyed them! I have to try these! 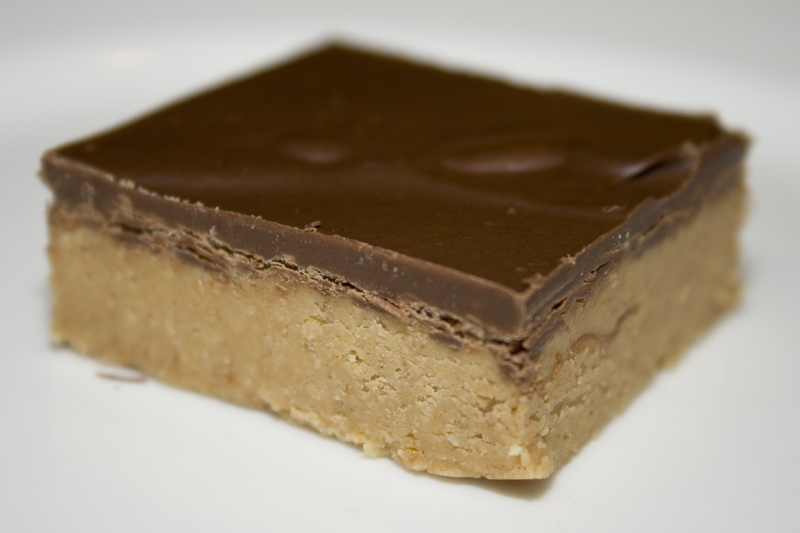 We used to get peanut butter bars in elementary school that looked a lot like yours. They were AMAZING!! And I’ve missed them… I’m 31 now… definitely going to try your recipe! Several readers have mentioned having something like these in elementary school — it always makes me wish I went wherever you did. Enjoy the flashbacks! I’ve had readers substitute crushed nilla wafers, chex or digestive biscuits. But you have to use some kind of cracker/cookie crumb otherwise they won’t solidify into a bar. i followed this exactly and my peanut butter part is really liquidly, not like the pic? any tps? less butter? Hmmmmm. I’ve never had it not set up perfectly. If you haven’t put the chocolate on yet and it isn’t setting up you could always mix in some more graham cracker crumbs until it firms up a little. I have no idea what may have happened that would make them liquidy. Can I melt Hershey’s Milk Chocolate bars and use those instead of the semi-sweet chocolate chips? Or would it throw off the consistency? You probably could do Hersheys without it messing with the consistency. Milk chocolate melts up pretty much the same as semi-sweet. Made these today for the first time..holy moly! Bet you can’t eat just one! Turned out perfectly! 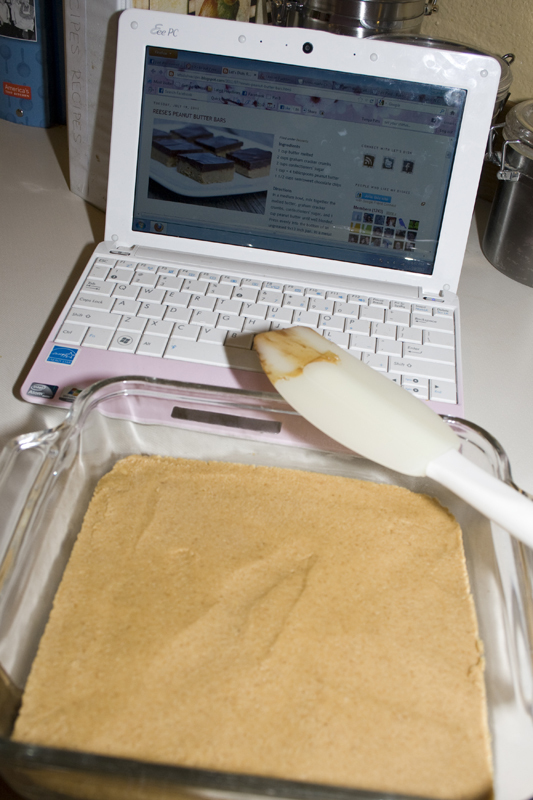 I’m so glad to know there are many people who do the laptop on the counter trick. I love it! Thanks for visiting! Looks so good!!! I’ve been looking for a new recipe with peanut butter in it, and this is IT! Going to try making these bars for my husbands birthday next week! Like Cheree I used half almond flour/ half oatmeal ground in food processor as a replacement for the graham crackers. Made it gluten free (assuming your oats are), more protein, and less sugar than if you used the graham crackers. Still amazingly tasty! Seriously, these are so good! Want to try it with Sunbutter for peanut free treat option. Great alterations Kate! I’ll have to pass them on to my GF sister! Been making these for years, except we use dark chocolate chips for the top, and have never put PB in with the choc chips…might have to try it that way! These also freeze great!!! I’ve had a couple people tell me they freeze great! Mine didn’t stick around long enough for that. Love how many people make versions of these. They are a great quick treat! Thanks for the recipe! It looks absolutely amazing! I don’t see why white chocolate wouldn’t work. If you love that kind of Reese’s, I say give it a whirl! White chocolate can be a little tricky when melting it though, so keep your eye on it closely. These are fabulous (and probably too easy to make!!) My family was super happy! Fabulous and easy is the best kind of food! Glad your family enjoyed! I used Graham crackers put them ziplock and used a small rolling pin to make them into crumbs. Thanks to my mom for mentioning useng the bag and thanks to my utensils can for having my small rolling pin visible. This looks much better than the store bought ones too! I’m excited to make them for my kiddos today! I use Jif (or Skippy). But I’ve had readers use natural peanut butter with success. I want to try making these but I life in england so we don’t have graham crackers or confectioners sugar, anybody know if I’m right in thinking digestives and icing sugar? Yes, those are the substitutes you want to use. I know others have done so with great results! England is where my family is from…my sisters just got back from a month over there with family. I’m pretty sure I’ve linked back to this page a million times since making these yesterday. In my blog, on my fb, everywhere. I love this things & have to resist the urge to just shove the whole pan in my face right now. Thank you so much for making & posting about these! Still have the taste of these in my mouth. A.M.A.Z.I.N.G. Agreed. 🙂 Glad you love them! I just made these today and they are so delicious! I’ll be making them the next time our church has a potluck! Aaaah, planning on being the most popular woman at church huh? Well played! thanks for the great, easy recipe. just made them, they are amazing! You are welcome!! Glad you love them! I am totally going to make these this weekend and make all the men in my boyfriend’s office praise me as a goddess. YAYAYAY! You won’t have to force them into it once they taste these. They’ll bow down at your goddess feet freely. Enjoy! I’m going to send these and pumpkin muffins with cream cheese frosting and they will worship us both! Hahahaha! I love that his is no bake so I don’t even have to labor for my worship. My peanut butter layer did not harden up. Would it make a difference that I measured a cup of butter and then melted it? When I cut them the peanut part stayed in the pan. They still tasted good but I wouldn’t call mine bars. I actually drooled while I was making these! geesh. I can’t wait for the kids to go to bed… LOL. Thanks for posting. These are absolutely incredible! I think I may have one for breakfast tomorrow, if they last that long! Thank you! Can you substitute regular sugar if you dont have powdered? I wouldn’t, no. The texture would be off with granulated sugar. I think it would be too gritty. I just made these and let them sit for 15 mins., then I sliced them and put them back in the fridge for 45. They came out perfect and taste fantastic! Thanks!…Also, I was eager to make these because back in the day (waaay back), in our school system, they served something similar, without the chocolate layer, in our cafeteria. I didn’t even hint to my husband , but he said ” you know, these remind me of the Peanut Butter squares from school”….Great recipe!…Enjoy Labor Day weekend! We did have great cafeteria food, but as I said, it was the olden days…. (o.k., I’m 53). BTW, I’m bringing the squares to my middle sons new house on Saturday, ( I froze them)….and they just told us we’re going to be grandparents!! !…1st one…Yikes!! !…Sorry to ramble.. Congrats!! That’s so exciting! Ramble anytime! I love hearing from you! Thanks!….I’m sure you’ll be hearing from me again. You have a great blog. My husband was raving about how much he loved the mini Reese peanut butter cups so I got on Pinterest and searched for recipes…and found this one! I read it last night and immediately texted my husband that if he brought home some powdered sugar and more butter, I would make him a yummy treat 🙂 He obviously grabbed the needed ingredients so I began making them as soon as he got home…might have been the yummiest midnight snack last night ever!! (and a piece with breakfast too…) Super easy and VERY yummy!! Will definitely be making again and again! So that’s how you motivate men to hit the store? Offer them goodies! Well played. Anybody have any idea how to do a low carb version of this? I’m guessing just using splenda or some other type of no carb sugar would be a start. Hi, would it be possible to replace the butter with margarine or will this completely change the taste? If you like margarine in general, I’m sure you’d like the taste of this with margarine instead of butter. I’d actually be more worried that it wouldn’t harden up properly if you switch out the butter. Any other ideas other than butter then? My sister can’t have dairy and I would hate for her to miss out! There are some soy butters that I used with success in recipes like this back when my daughter had a dairy allergy. Earth Balance (if you can find it) works particularly well. You just want something that firms up when cold like butter does. Most margarines stay soft in the fridge. omg so good! you can totally do them with crunchy peanut butter! I’ll bet they are delicious with a little added crunch! I bought milk chocolate and white chocolate chips and put half on one side and half on the other. Both sides were awesome!! If you like the white chocolate reeses try this recipe with white chocolate chips it is so yummy! I’ve never even heard of white chocolate reese’s! Sounds delicious! Thanks for visiting! Glad you found this recipe. It is one of the greatest things ever! 🙂 Enjoy! Thanks for this recipe! Here in northeast Ohio, we call these Hollywood squares :). Not sure why! Lol! They were a staple in school cafeterias when I was growing up….we all loved days they served these! Thanks for taking me for a stroll down memory lane…I have a batch chilling in the fridge right now! :). Blessings! Looks delicious, definitely going to make these this weekend! You are most welcome! A few more bites always helps decisions. I don’t think there’s anything wrong with that idea at all. Help! I just made these. I haven’t even put the chocolate layer on top yet. The peanut butter layer is kind of loose and a little greasy looking. Does it also firm up as it chills in the fridge? I am planning to take these to a fall picnic tomorrow so I’m hoping they turn you delicious. Thanx! Melissa, I hope they firmed up ok for you! Sorry I didn’t respond sooner! How about a sugar free version?? I’m sorry, I haven’t tried a sugar free version. If you have substitutions you’d like to make, please let me know how it turns out! Just made these, I had no graham crackers so I used crushed up chocolate coffee biscuits (http://www.darefoods.com/Img/Flavours/SimplePleasuresCookies_Chocolate.jpg) instead, and it tastes awesome! Oh gosh, I can’t even begin to tell you how many times I have used this recipe. It has become a staple in my life! haha I was determined to find my original comment on these because I still do use the chocolate cookie crumbs and still love this recipe more than anything ever! :)! I can hardly wait to make these they look wonderful thanks!!! Just made for a co-workers bridal shower- huge hit! Lots were asking for recipe!! Yum yum yum…thanks for posting! They were not only delicious but super easy to make. Kate, glad you had great success! I love getting asked for recipes. Sure sign of a winner! So grainy from the graham cracker crumbs. Susan, I think maybe you needed your crumbs to be a little finer. I’ve had many many readers make these with success, but if the grahams aren’t crushed fine enough you’ll taste the grit from them. No, you need to use powdered sugar. Otherwise it will be grainy. So I made these tonight using cookie crumbs instead of graham cracker crumbs (bc I didn’t have any but I NEEDED to make these ASAP!!). Suffice it to say, they did not come out properly. They were very very liquidy. Any idea why that happened? Made the recipe tonight. Had to “create” the graham cracker portion as I didn’t have any. I used vanilla wafers, Reese’s peanut butter cereal, saltine crackers and oatmeal. Ground it together very finely in my food processor. The end product turned out great! Everyone loved it. I was wondering if this would be a good recipe to use for a Christmas cookie exchange? Thoughts? On top you could put red and green M & M’s for decoration. But I’m not sure the bars will hold their firmness and consistency if out of the fridge for too long. I’ll test this theory out. Loved the recipe! Even with my “had to” modifications!! Made this last night. Didnt have any graham crackers, so I used oatmeal, vanilla wafers, Reese’s peanut butter/chocolate cereal, and saltines – all ground in my food processor. Most of it was the vanilla wafers. Turned out AWESOME! sooooo good! I was wondering if this would be a good item to use for a Christmas cookie exchange? Thoughts?? Decorating the top with red and green M&M’s would make it festive. My only concern is how long outside of the fridge the bars would hold their consistency/firmness. Im not worried about them softening as much as I would be concerned with them falling apart – or seperating chocolate top from bottom. Right out of the fridge they are perfect! What the crap?!?!? These look amazing. Definitely making them soon! Is there anyway that I could substitute powder sugar for regular sugar? Or will that ruin the whole recipe? You cannot sub the sugar – the texture will totally change. You are SO RIGHT!!! I TOTALLY hate you for this! And so do all my clothes, and my waistline, and my bathroom scale! These are AMAZING! I really just wanted to spoon the filling straight into my MOUTH! Thanks, but I hate you too. 😉 SO GOOD! I didn’t have graham crackers so I used nilla wafers but didn’t have enough and so while searching through my very empty cabinet decided to use oatmeal. It probably changed the texture a bit but I kind of like it. Can’t wait to try them once they have cooled! can chocolate bark be used instead of chocolate chips? I see a whole lot of recipes calling for chips, but I think the bark would work much better. Yes, you can use chocolate bark – anything that will melt up and then firm as it cools will work fine. Another suggestion for those who don’t have any graham crackers on hand: crushed up cheerios. (Or probably any type of crumb-like cereal) I crushed them with a rolling pin and it worked fine. Just made them with rice crispies since I was also making buckeyes! They were yummy! What the what??? I just found the picture on pinterest and I can’t believe what you created. This might be heaven on earth. Or better! Made these last night. Super easy and SUPER GOOD! Thanks. Did you try popping them in the fridge to firm them up a bit? Not sure what could have gone wrong – I’ve made these dozens of times with great results. I love the fact that this makes a9x13…and i always have they ingred.on hand! Thank you! Ingredients always on hand is very dangerous with these. Can I use margarine instead of butter? Or is this one of those recipes that you can only use butter? I believe some of my readers have used margarine with success. My husband and I just made these they are in the fridge now can’t wait to taste them. Isn’t it funny how the weather affects baked goods? I’m making these later today, they look sooo yummy!!!! But, I was wondering can I use milk choclate chips instead of semi sweet ones?? I didn’t have Graham crackers or crumbs so I substituted peanut butter puffs cereal( placed in food processor to”crumb”)instead. They turned out great…but you need milk to cut the sweetness! Yum! Where’d you find that special cutting tool with the ruler on it?? Love it! Yes, I’d store them in the fridge overnight. Thanks for the recipe! I rolled my homemade Reese’s peanut butter up into little balls and dipped them in the melted chocolate. Maybe this question has been asked but would it be ok to sub coconut oil for the butter? I’ve never used coconut oil – so I’m not really the best person to ask. If you’ve subbed it for butter in other things with success, I’d say give it a whirl. I just tried coconut oil and the mixture is pretty runny. I would use much less oil next time. As it is, I added about 1 cup more crumbs and a little more PB and I’m freezing the mixture before adding the chocolate. Hopefully it turns out okay! I have been making a recipe just like this for years and people go crazy for them! Have you tried using milk chocolate chips instead of semisweet? The milk chocolate makes them taste even more Reese-like! 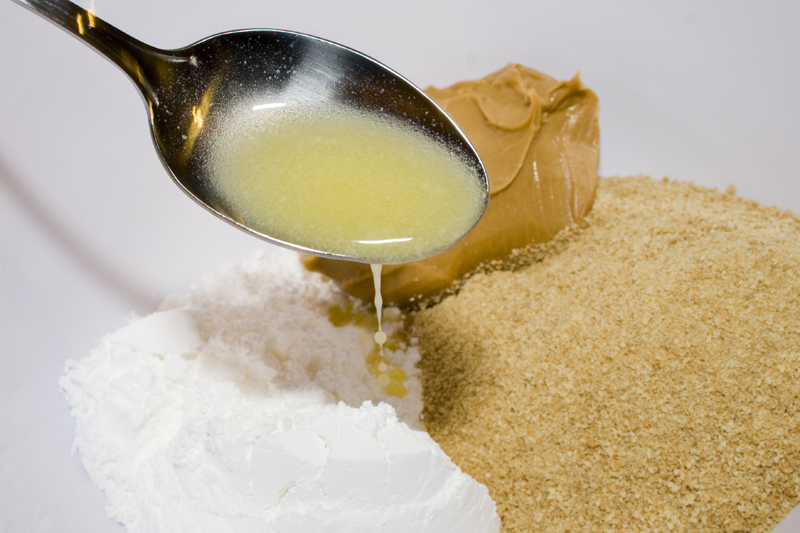 OMG, I’m in love…What do you think would happen if I mixed the PB and Sugar and Butter ( I love Butter) in the Food Processor? I’m picturing a very smooth texture, but not sure if it would be firm enough? Either way, I’m making these this weekend and eating them all! Thank you for this recipe. I have searched for years for these bars. In elementary school this was a favorite dessert of I could safely say the whole school. Mini riots were stared when the lunch room ran out. Now I can make these delicious peanut butter choc bars for my family. I made this last night, but I made substitutions. Instead of graham crackers, I put two cups of oatmeal into my food processor and ground it fine. I used no butter at all, and I used a scant 1c of powdered sugar. There is a slight chew due to the oatmeal, but beyond that they are fabulous. The bars are firm at room temperature, and the oatmeal absorbed the oil from the peanut butter. This recipe has been a hit everywhere I take them! Last night I even tried it with gluten free graham cracker crumbs (found them at Giant) and they were just as yummy!! My friend was super excited that you can easily change it to GF and it was still great!! These are AMAZING!!!!! I’ve made these twice now and every time I feel guilty since I’m trying to lose wait….they are just a slice of Heaven!!!!! The kids think they are better than Reese’s Peanut Butter Cups! This is definitely a love/hate relationship!! Approximately how many graham crackers equals 2 cups of crumbs? I’m wondering if you recommend unsalted butter or regular salted butter. The recipe doesn’t specify which type so I’m thinking salted as a default, correct? Can’t wait to make these for friends this weekend! Looks great! Also looks like I added too much butter…recipe calls for 1 cup melted butter…my sloppy peanut butter mash has a half cup too much liquid possibly…. Maybe suppose to be 1 cube??? This is a terribly and wonderfully dangerous recipe. I guess I will just have to up my Zumba game…. AMAZING! Better than any Peanut Butter & Chocolate treat I have ever had. I actually made this more for my husband than myself b/c he’s more of a pb fan than I am, but we now are both fighting over who gets to eat more! Lol…you have to make it, if you haven’t! It’s so awesome! I’m not sure what went wrong but I think the butter is to much mine never got to the point I could press them into the pan , not sure what I did wrong . Used this recipe to make peanut butter balls. I added about half a cup of extra crumbs and let the mixture cool a bit before rolling the balls. Thanks for the recipe!! I am a peanut butter and chocolate fanatic. These were amazing! I only made 1/4 of the recipe since I knew I would eat most of it in a couple days… and I was right. When I make again, I will have to give away some as gifts! thank you! Just made these last night by the recipe for the most part. They came out AMAZING. I used Reeses peanut butter and milk chocolate chips. Om nom nom! I did read some comments about the chocolate and issues with cutting the bars. I put the peanut butter mixture in the pan-let it cool for 10 minutes in the fridge, poured the chocolate on, and let it cool in the fridge for 15-20 minutes. Before the chocolate cooled completely, I cut into bars and put back in the fridge. They came up fairly easy (I did spray the pan) and everything adheres wonderfully and was really yummy. Thanks for the details on your cutting method! Glad you loved them! The pictures show a square pan (and thicker amounts of peanut butter) but the directions say 9×13 and come to different proportions. I made a half batch and put it in a square pan when doing the photos. But I’ve also made a full pan as directed and they turn out beautifully. If I had a package of chocolate chips, I’d make this right now! Thanks for sharing. Printed it out and will pick up the chocolate chips SOON! Hi. I have a question. The recipe calls for 1 cup pb. It calls for 1cpb in the bottom layer, so, how much pb do you put with the chocolate on top?? The recipe actually calls for 1 cup + 4 Tablespoons. The 4 Tablespoons is what you put in with the chocolate. Is there anything that you can think of that I could substitute for the butter? Was hoping to make a vegan version if possible. Earth balance butter could be substituted. Not sure how it would affect the stability of the finished product, but I’ve always had good success using Earth Balance products in place of their animal product counterparts. I’m about to make these, but with Townhouse crackers (like Ritz, but oval in shape, the Ritz weren’t on sale ;). Anyways, my pb is really mild and sweet (it’s natural), so that’s why I am going with salty crackers. Nope, don’t think anyone could hate you for sharing this recipe! 😀 I shouldn’t share that I am making these at breakfast time…and we haven’t had breakfast yet, but that’s how I roll! Well, surprisingly, mine still turned out a little too sweet. I guess I should do like 1/3 less of each of the stevia and protein powder or at least less of one. Very fun to make though, and still tasty! Ope, I forgot to mention that I made mine in greased mini muffin tins for easy portioning and removal (they were so cute :). I made these for a potluck at work. Everyone loved them!! They tasted just like a Reese’s cup 🙂 however, it takes longer than 5 minutes to make them… But they’re worth the wait!! I have tryed a lot of sites for this receipe..My family loves this but would like a softer chocolate on top..Any suggestions on this?? Thank you.. Try making a firm ganache instead, adding the chocolate to warm cream. Look up recipes on-line. You want a firm one, not runny like you pour over a cake. I’m from Germany, I would Love to make these but we don’t have cracker crumbs. Do you know anything I can use instead? I’ve made this a bunch of times. I love it. I have found I enjoy it best with milk chocolate chips for the top layer. I’ve also found that they are just as good with ground oats instead of graham crumbs, 1/2 as much sugar, 3/4 as much butter but use coconut oil, and a bit more peanut butter in the bottom. Mine turned out runny too so I added more powdered sugar, which helped a little. I would use at least two less tablespoons of butter next time and let it cool. I think the butter was too hot when added. Also they were very very thin. Maybe my cake pan is slightly bigger than 13×9, but I don’t think so. Still tasty, but not as pretty to take to someone’s house for dessert. Kris, so sorry yours turned out runny! For those of you having a hard time removing it from the pan! Pam spray the pan before you start adding the peanut butter mixture. I like to line the bottom of the pan with parchment paper then spray with Pam. It. Will be easy to flip onto a board then reflop in upright position!